The band is taking the music scene by storm with infectious live performances that cross musical borders. They’ve played with bands such as folk/indie favorites Edward Sharpe & the Magnetic Zeros, Mexican icons Cafe Tacuba, Colombian superstar Juanes, L.A. legends Ozomatli, the Los Angeles Philharmonic Orchestra, and most recently with Talib Kweli. Tastes Like L.A. will be self-released in April. 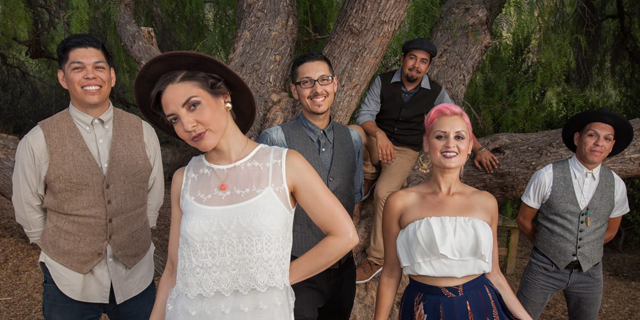 Produced by Eugene Toale, it comes five years after Las Cafeteras’ debut album, It’s Time. The album will include guests musicians such as Grammy-nominated bassist Gloria Estrada, bassist Moises Baquiero from Mariachi Manchester, son jarocho maestro Jorge Mijangos, and Stewart Cole from Edward Sharpe and the Magnetic Zeroes on trumpet. Often on the road, Las Cafeteras just wrapped a show at the Folk Alliance International Conference in Kansas City and will be touring through March and April, with some summer dates already announced. Beats y Batería. How do classic rhumbas, 100 year old folk tunes, and ancient rhythms fit in the percussive electronic music of today? Come find Beats y Bateria: a collaboration of Havana-born, Chicago-based DJ/Producer AfroQbano, Moldovan-born fado jazz singer Ana Munteanu, multi instrumentalist Patrick Donley and global beat drummer Daniel Crane. The four members come from different musical homes but what they do together is set a mood of celebration and nostalgia under the umbrella of global dance music.